Forgive me if I haven't been doing nail art for quite awhile. If you are already following the Simply Rins Facebook Page, you might remember one of my status messages wherein I said one of my nails broke really bad. It broke on the side, almost at the middle while I was fixing the zipper of my luggage. I was forced to cut it really short until the tear reaches the nail tip. Then, I had to wait for it to grow back to a decent length before I do some nail painting. The length and shape is not yet how I'd like them but that's one of the good things about nail art. You can actually create a design that could camouflage or enhance the shape of your nails! I decided on a simple floral design that is bold and feminine at the same time. I named this nail design, A Closer Look on Flowers because it is as if you're magnifying a flower on your nails. Hopefully, I have achieved my goal. The inspiration for this nail design came to me while I was watching a rerun of Private Practice on TV a few nights ago. I saw a throw pillow with very big flowers that looked like stencils. I figured it would look great on nails. I also thought the design would work with the nail I was nursing. Big flowers on my nails. I used 2 coats of OPI Fly, the same one that I used for the Heart Patches Nail Art. I always find this a very fun color. For the flowers, I decided on a very light yellow. I used acrylic paints and a small stripper nail art brush for this design. Oh, and perhaps you've noticed my skin darkened. After 3 out of town trips that had me under the sun, it couldn't be helped. Sunblock helped but apparently, it did not prevent a tan. Painting this floral nail art is quite easy. 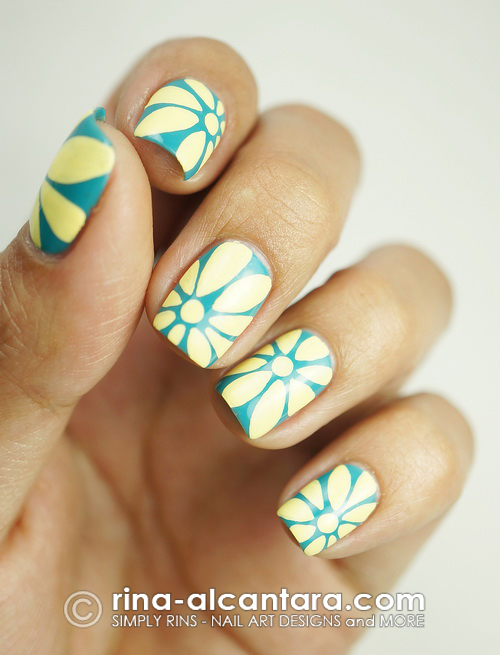 First, place a dot on where you would like the center of your flower would be on your nail. I prefer to place the center in random to create different point of views. But if you like uniformity, go ahead and select a center that would be the same on all your nails. Then use a small stripper nail art brush to paint the petals. For the stencil effect, make sure you no shape would touch each other. This design looks lovely up close and from a distance. I am not particularly proud of my color combination here but I think the design has great potential for other colors. Needless to say, this would probably look gorgeous on black and white. Come to think of it, is there a nail design that would not look good with black and white? These look fantastic Rina, the colors and clean edges are just brill! I love this! It's so simple, but still very eye catching. I don't understand the stripper part and do u have youtube? If not u should!